This high speed linear flame treater can increase the surface tension and dyne level on plastic or glass bottles for printing. It has also been used in many glass bottle applications to remove residue and animal fat that lines the bottles after production. This extremely adjustable flame treater can treat both plastic and glass bottles. The first set of opposed burners will treat the opposing sides, or quadrants of round bottles. The adjustable turner will use the neck to turn the bottles 90 degrees. The second set of opposing burners will treat treat the opposite sides, or quadrants for round bottles. Speeds can be set to match your specific line speed of upstream or downstream equipment. This truly is one of the most versatile flame treaters on the market. 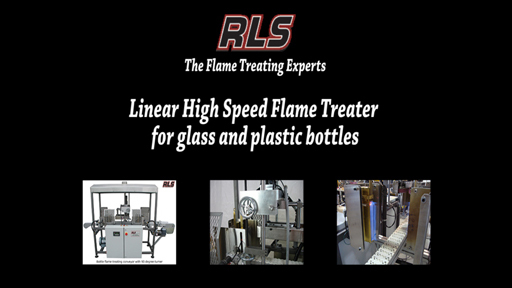 The RLS high speed bottle flame treater can be built to meet your specific bottle specifications. Virtually any size part with a compatible neck finish can run on this flame treatment unit. 3 ¼” wide tabletop chain variable speed conveyor with AC inverter drive. The conveyor can have a vacuum chamber along the entire length. Dongan automatic ignition systems and Honeywell flame safeties with flame rods. Regenerative blower for the air supply to the burners. Variable speed top neck turning system. Turner system is adjustable up/down and in/out via linear guides and crank handles. Belts have a soft lining for secure gripping of the bottle neck. Unit comes with two variable speed DC motors. One gets set slightly faster than the other to allow the bottle to turn 90 degrees. Belts are adjustable in/out with a 0-4” opening and up/down with a 12” range. Lowest belt height is 0.5” from the conveyor top to the bottom of the belt. Back up photo eye to shut down the system should a product back up occur. Fallen bottle detector and reject station prior to entering the flaming unit.